Flash Forward is a Free-for-All minigame appearing in Mario Party 10, and returns in Mario Party: The Top 100. 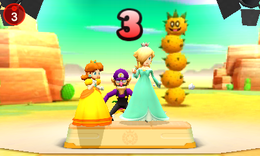 This minigame takes place in a studio where the players are standing in a random background from either five other Mario Party 10 minigames or three other Mario Party: The Top 100 minigames. The objective is to brawl with all the other players in order to make it to the platform and create a pose for the camera. If a player is ground pounded, they will flatten and become unable to move for one second. Once the timer is up, the camera will flash, and any player on the platform creating a pose will gain ten points. Sometimes, there's no clear winner or loser. In Mario Party: The Top 100, if there is a tie and everyone is in 4th place, a music track from Mario Party: Star Rush will play. Description – "Get on the platform, and hold a pose for the camera!" Description – "Be on the stage at the moment of the photo!" On-screen – "Be on the stage when the camera flashes!" Spanish (NOE) Chupacámaras "Camera Hogs", from chupar cámara (wanting to be the focus of every picture, literally "camera sucking"). Portuguese Manter a Pose "Keep the Pose", usually meaning "keep composure"
This page was last edited on January 1, 2019, at 12:50.